This David Donahue sport shirt is made with premium and luxurious cotton material giving you a soft on the skin feel. Adding a fresh and modern element to the dress shirt are the colored buttons. Keeping this mens sport shirt easy to wear are the (2) added back pleats for extra comfort. Practical and always appreciated, this sport shirt features a front chest pocket. 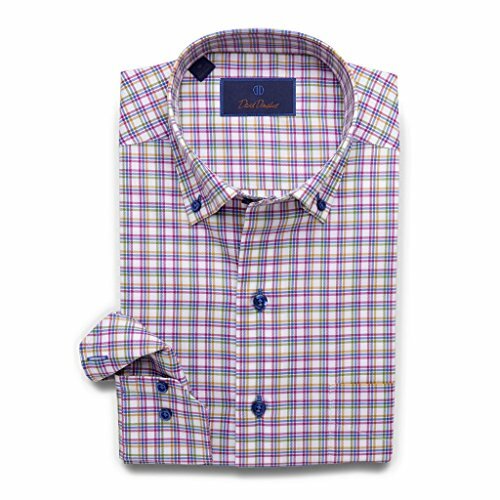 David Donahue sport shirts are selectively constructed from the finest imported materials, making sure each product keeps its quality and austereness throughout each wear. If you have any questions about this product by David Donahue, contact us by completing and submitting the form below. If you are looking for a specif part number, please include it with your message.